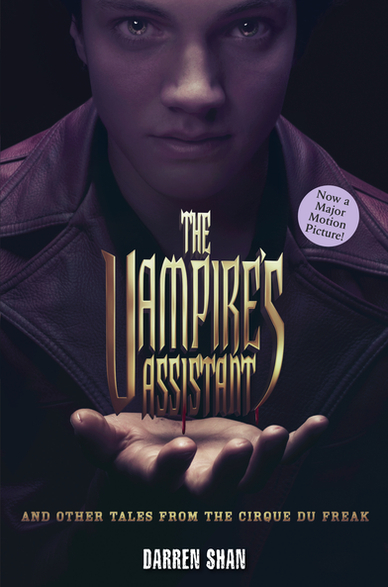 Darren Shan’s bestselling Cirque du Freak series makes its way to the big screen this fall, with The Vampire’s Assistant – and we are offering some goodies to get in the spirit of the film! 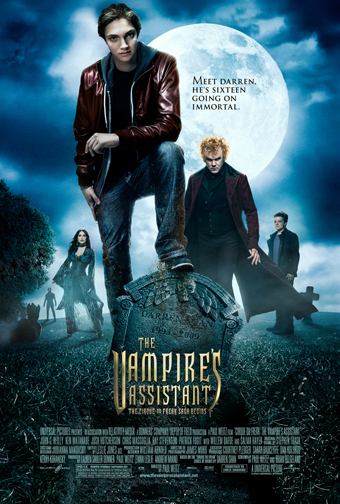 New movie edition features the first three books–Cirque Du Freak, The Vampire’s Assistant, and Tunnels of Blood— bound up in one volume! Do you love to be scared? Then don’t miss the terrifying adventure that begins when Darren and his best friend, Steve, get tickets to the CIRQUE DU FREAK, a wonderfully bizarre and creepy freak show. Brace yourself for thrills and chills as the boys witness a parade of grotesque creatures and face their deepest fears by entering the darkest world of the vampire. In the blood-curdling tradition of Anne Rice and Stephen King, CIRQUE DU FREAK will have you shrieking for the next horror show! CIRQUE DU FREAK has been rated PG-13 (Parents Strongly Cautioned – Some Material May Be Inappropriate for Children Under 13) for sequences of intense supernatural violence and action, disturbing images, thematic elements and some language. Check out the official movie website HERE. The contest is open ONLY to US residents who are at least 13 years of age as of October 1st. In order to enter, simply leave a comment here telling us if you had to live with the Cirque du Freak, what supernatural creature would you wish to be (half-vampire, werewolf, bearded lady…you name it)! Other multiple entries that do not follow the rules specified above will be disqualified. If you have voted and linked, but have only left us with one comment, you will only be entered one time into the giveaway – so don’t shortchange yourself! The contest will run until October 23 at 11:59 PM. We will randomly select and announce our winner on October 24th. Good Luck! Oooh, I think I would want to be a half-vampire. I think that would be extremely interesting.. especially after reading Jeaniene Frost’s Night Huntress novels! +1 I voted for the best Tshirt slogan! I would pick half-vampire, that would be cool. I voted in the poll “there is a little freak in all of us”. I would wear that proudly. I voted in the poll, there definitely is a little freak in all of us! Half-vampire would be super cool. I’ve got to go with Half-vampire. I’m excited now about the movie after watching the trailer! +1 por favor…I voted for “there’s a little freak in all of us” love it. I think if I had to I’d rather live with a half-vampire. I half-vampire sounds like it would be lots of fun! A full-fledged one would be even better! I would be half vampire. I voted for 100% Freak! +1 I voted for the best t-shirt slogan. I would love to be a werewolf or were cat of some kind. I just have a soft spot for were animals..lol. I voted in the poll also!! I would choose to be a half vampire-half werewolf. I’d go with half vampire! I think I’d go with half-vampire. Even full vampire would be cool. After seeing this trailer, I so can’t wait till the movie comes out. My boys are going to love it!! I’d be a werewolf. Thanks for the entry. I voted for There is a little freak in all of us. And I voted for there is a little freak in all of us. I would love to be a half-vampire. I read this entire series already, so no need to enter me 🙂 I would, however, love to be…I don’t know…something that freezes time. Hours of listening to boring lectures on plants have led me down many day-dreaming paths, and one of the most re-occuring was freezing time and slapping my teacher silly, then sitting back down and watching her look around in bewilderment, holding her cheek tenderly. I would be a vampire who can cast spells. I would want to be a half-vampire! +1 I voted for the T-shirt slogan. half vampire all the way! I would be half vampire. Thanks for the contest! I also voted for 100% freak. i also voted 4 the “theres a little freak in all of us” t-shirt. its adorable. I’m gonna’ choose to be a bearded lady. Can I use that to go in the men’s restroom when the ladies’ line is too long? I would want to be a werewolf! Please count me in. Thanks for the giveaway. I would be a werewolf. Enter me! This looks awesome! OMFGG I FREAKING LOVE CIRQUE DU FREAK , CANT WAIT TILL I SEE THE MOVE!!!!! I’d definitely want to be a half-vampire if I liked with Cirque du Freak. If i had to join the cirque du freak i would be telekinetic. It would be so cool 8) !I would levitate items and even myself and people in the audience! 😯 I swear it would be the most amazing experience to be apart of the Cirque du freak or even just see it once!! Since I have a vampire obsession, I’m going with half-vampire! I had no idea that this movie was based upon books…No I really do have to read them. I posted this giveaway in my sidebar. I voted for we all have a little freak in all of us t-shirt. I think I’d have to go with the half-vampire. also +1, voted for a T-shirt caption. I’d want to be a shapeshifter. It’s be crazy-amazing to be able to look like anyone in the world! I would love to be some sort of shifter. Pluses: all the extra sensory abilities, strength. Minuses: the extra hair. I hate shaving my legs now, so this would DEFINATELY be a downer! I’d like to be a half-vampire or Dhampir. +1 – Voted for “There is a little freak in all of us” T-shirt. Definitely shapeshifter. Ilona Andrew has convinced me that you can be wicked powerful in human and animal form, not to mention the perks of a pack backing you up. They have the ability to upgrade to who they need to be when things get dicey. And do most of them seem to be attractive too, in both forms? Must be another perk. I would be a siren. The beautiful mythical creatures have always been seducing men or more specifically sailors to their deaths. i would be an abatwa(little person that rides ants from Zulu mythology) i get to shoot people who disrespect my size with poison arrows! Posted this giveaway on my sidebar! Posted the giveaway on my sidebar! And my choice of lifestyle would be a shapeshifter. Preferably a telepathic one. With great…assets, heh. I think it would be really cool to be a half-vampire, because they still get a some cool powers, like aging slowly. What I would want to be…hmm. I don’t rightly know. I think it would be neat to be a centaur or possibly a half-vampire, but I find the prospect of extra limbs or having to drink blood rather…disheartening. So, I’ll go with a fairy, with all that magic and the little wings. That would be fun! I would want to be half vamp! And I voted in the T-shirt contest. I voted for there is a little bit of freak in all of us. There is, sometimes theres a little bit to much in us which is why we call some people weird. I also put the giveaway on my blog! I’d have to go with half vamp because I think the furriness would bother me:) Is that even a word? I voted and my saying is winning! I would be 1/2 vamp for sure!!!! Thanks for this chance to win this neat stuff!! I would choose to be a werewolf. I’d like to be a shapeshifter – one that shifts into an eagle. I voted for “There is a little freak in all of us”. I would wanna be a half-vampire, because they eventually get really cool powers. I would choose to be a half-vampire! +1 I voted for “100% Freak”! If i live with cirque du freak. T would enjoy every minute of my life. I would be a vampiere and hang out with the crew. Wow,Fantastic article,it’s so helpful to me,and your blog is very good,I’ve learned a lot from your blog here,Keep on going,my friend, I will keep an eye on it,One more thing,thanks for your post!welcome to . I was born in Malibu California on August 18 1994. This would be so awesome to be a vampire and be trained by crique du freak. i would love the experience of immortality. ??????? ?